Phonsavan is the main town of Xieng Khouang province, one of the poorest provinces of an already poor country. The town was established in the 1970s and sprawls out from a meaningless centre with no plan or direction. Public transport is limited and sporadic. It is illegal to rent your own vehicle here. None of the streets are named or at least the names are not used. There are no public phones and the weather is bitingly, freezingly, heartlessly cold. Phonsavan is neither friendly nor unfriendly. It just doesn’t care at all. 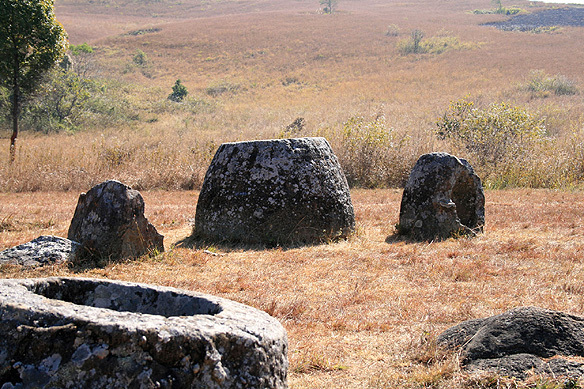 Apart from the historic Plain of Jars archaeological site, the province is best known for the pounding it took during the ‘secret war’ in Indochina which took place from 1964 to 1973. Many of the sights are battered monuments to this recent violent history. Huge bomb craters, some 15 meters across and 7 meters deep, dot the landscape while hundreds of thousands of land mines still remain buried in the grassy meadows. Some sources estimate 800,000 Lao were killed during this period. The UK-based Mines Advisory Group (MAG) is currently engaged in clearing the land of Unexploded Ordnance (UXO). The process began in schools and hospitals and has now moved on to those areas where fatalities are greatest. 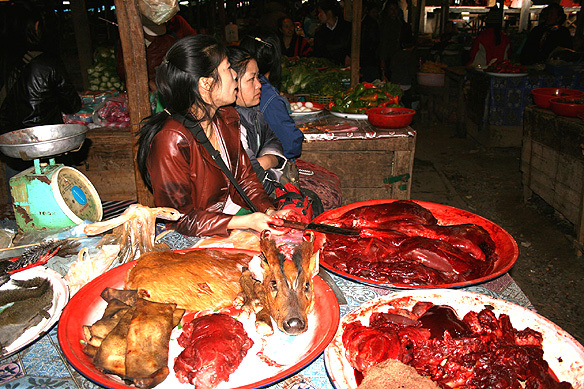 My first port of call in Phonsavan was the local market selling strangled wild cats and beavers, chopped deer, and live pigs and frogs. 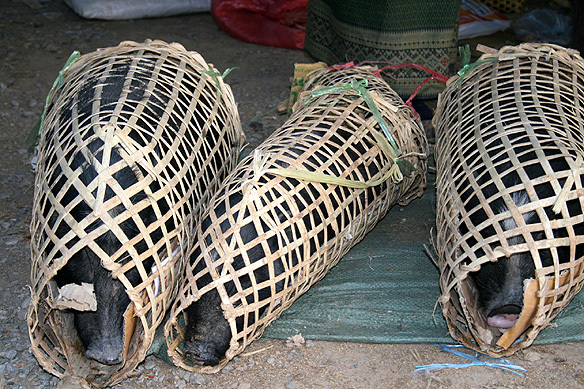 I must confess I was quite disgusted at my own grossness to be clicking away at squealing pigs trapped in cane baskets and wild felines staring blankly at me from across table tops … but then this was all part of Phonsavan’s truth. 8:00 pm. My bathroom shower was leaking, the whole floor flooded, and huge leggy mosquitoes swarmed around me. The room was freezing. 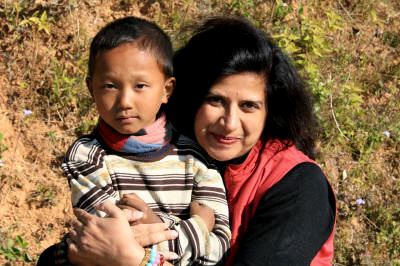 I had three blankets on, wearing all the clothes I had brought along with me, and was still cold to the bone. Apart from these small misfortunes it was a lovely room with high roofs, whitewashed walls, and beeswax polished floors and furniture gleaming dully in the darkness. I could hear a Thai tour group singing in the corridors and the roar of tuk-tuks on the main road. I went off to sleep, still as a corpse in a coffin in a desperate attempt to stay warm, accompanied with eerie thoughts of being stranded in this strange poker faced town with no means of escape at all. 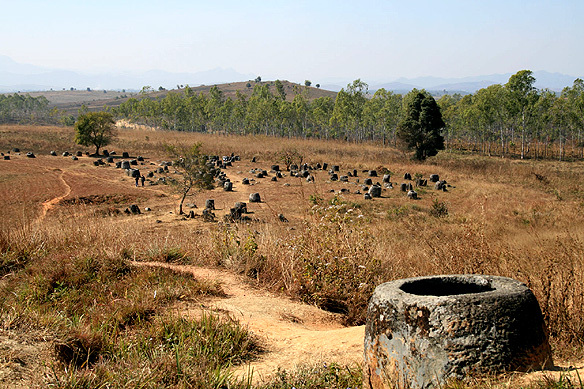 An early morning start the next day and I was at the Plain of Jars, the reason for being in Phonsavan. It is a beautiful place. Serene and ageless. The undulating plateau stretches for about 50 kilometers east to west, covering an area of 1,000 sq kms at an altitude of 1,000 meters. There are all together 136 archaeological sites in this area containing thousands of jars, discs, and carefully arranged stones. Of these only three are open to tourists. Most of the jars are generally between 1 meter and 2.5 meters high, around 1 meter in diameter and weigh the same as three small cars. The largest are about 3 meters tall. The jars have long remained an archaeological mystery leaving generations of historians confused by how they got there and what their exact purpose was. It is, however, likely that the jars are in fact 2,000-year old stone funeral urns; the larger jars being for the aristocracy and the smaller ones for the public. Tools, bronze ornaments, ceramics and other objects found in the jars indicate that a civilized society was responsible for them, but no one has a clue as to which one as the artifacts bear no semblance to those left behind by other ancient Indochinese civilizations. After wandering carefully within the demarcated paths at the site (there are still land mines buried outside the paths) I visited the original capital of the province. The old capital of Xieng Khouang—now rebuilt and renamed Muang Khoune—was destroyed during the war between 1964-1969 and presently has a population of a mere 14,000. Before the bombing, the town was extremely picturesque, similar to Luang Prabang, with over 400 colonial buildings and 30 wats and pagodas. 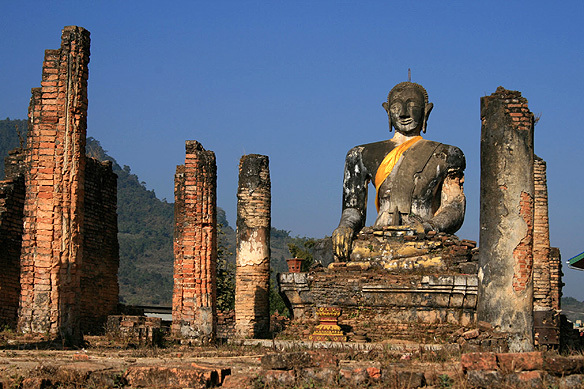 Nothing exists today except for a handful of wooden Lao houses, a market area, a large seated 600-year old Buddha all battered and worn out, and the lesson on how easily war destroys life’s riches into nothingness. 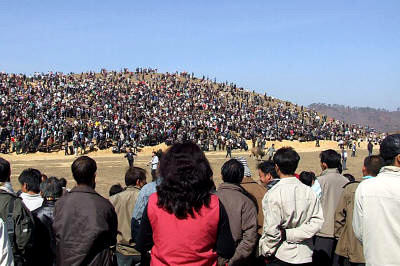 Today was the Hmong New Year and festivities were abounding in the province. 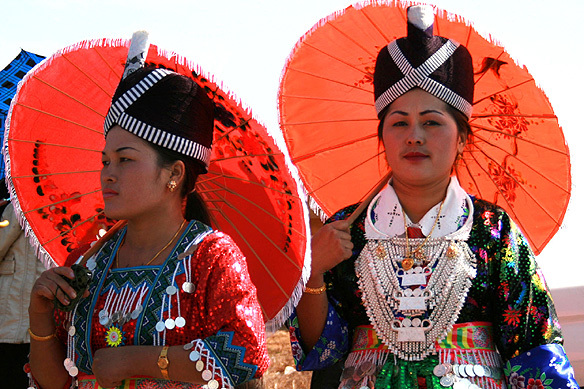 The Hmong are probably the most popular tribe in Laos. There were still a few hours to my flight to Vientiane and so we drove on further to a range of dusty hills by the edge of Phonsavan where the entire Hmong world had gathered together to witness a rather insipid bull fight cheered incessantly by excited commentators rattling away on loudspeakers, whilst young girls dressed in all their finery strutted away on high heels holding parasols, and couples threw small balls at each other for hours on end. There were no other tourists. No foreigners. And it was wonderful. To briefly slip into another world and be part of its own personal unique moments of celebration. 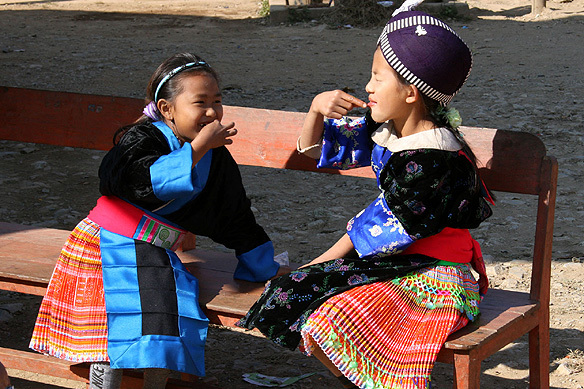 This entry was posted in Exploring our World, Laos and tagged Festivals, Hmong, Hmong New Year, Laos, Mines Advisory Group, Muang Khoune, Phonsavan, Plain of Jars, Secret War in Laos, Things to do in Laos, Xieng Khouang by Rama Arya. Bookmark the permalink.